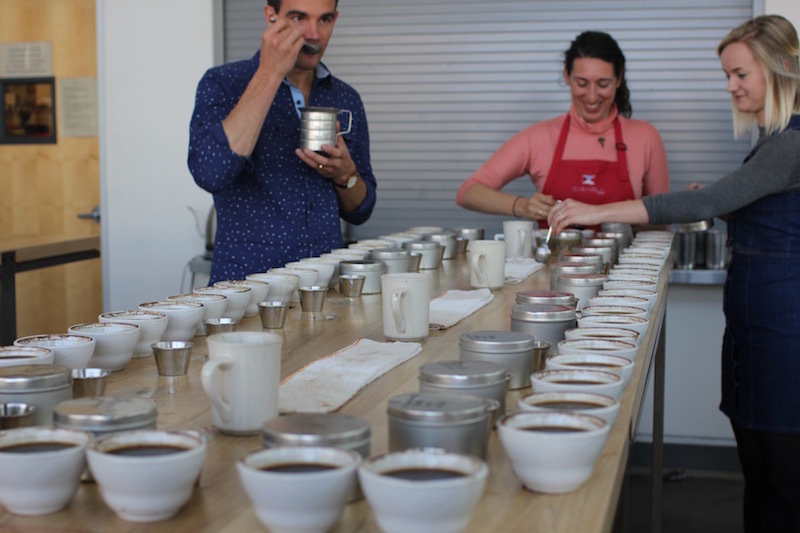 In our first post in the two-part The Language of Cupping series, we learned how creating an official standard for the taste of coffee makes it possible for industry members to more accurately communicate about flavor and quality. When they first started out, Blue Bottle’s own coffee experts, like Green Coffee Buyer Charlie Habegger and Green Coffee Coordinator Carly Getz, quickly learned that developing their own personal lexicons was key, not only to using the World Coffee Research Sensory Lexicon—which identifies the 110 flavor, aroma, and texture attributes present in coffee—but to refining their own sense of what makes a coffee taste good. Our experts are eager to dispel the myth that only people in the coffee industry can better attune themselves to the taste of coffee—these experiences are for everyone. Of course, developing this skill does take practice. The complexity of communicating subjective sensory experiences with other people is why the Lexicon, as well as the SCAA’s Coffee Taster’s Flavor Wheel, is so important. As Carly has noted before, experience doesn’t just inform your vocabulary—it drives it. “People should drink all coffee, even coffee that isn’t Blue Bottle,” says Judith. “Enhancing palate development means learning about ones likes and dislikes, and what you're sensitive to. Context is really important, and it transcends brands." As well as having her tastes expanded by her study of coffee, Carly has found that mindfully experimenting with other flavors has helped her build her coffee cupping vocabulary. To help keep track of your reactions and reflections while you’re drinking coffee, Carly and Judith both recommending jotting them down in a notebook or on your phone. “For me, cupping is really just thinking about what you're smelling and tasting—it's as simple, and complicated, as that," says Judith. "While we make these evaluations professionally, the initial exercise for those at home is the same routine, just with less rigor. Smell, taste, think, and then write down, even with minimal vocabulary at first, your gut reactions to a coffee's smell, intensity of flavor, body, acidity, and aftertaste. All of these register as different forms of likeness and can inform folks about their own preferences." While tasting coffees at home is a great way to practice mindful tasting, all of our experts agree that doing so with others is crucial to developing your lexicon. When it comes to mindful tasting, learning how to focus is just as important as putting in the time. While Carly and Judith rely on tools both concrete and abstract, to do their jobs, they aren’t limited by them.